You cannot ask for a better combination really. Hearty thai food with all the sweet, salty and spicy flavours on your palette then ending off with a nice cooling dessert thereafter. Prices are cheap reasonable for the quality and quantity given, a major incentive to head down to such an ulu area that charges a $5 parking fee! Ah Loy Thai’s just opposite the new and revamped Tom’s Palette and it also has a new wing to seat more customers. Evidence of good feng shui in that particular corner of Shaw Tower I say! Let’s start with the dish that impressed both the friend and I tremendously. Pandan Chicken was skinless ( thankfully. chicken skin just looks ugly and terribly unappealing to me especially if it’s the steamed version with all the pock marks. gasp!) but the remaining fats did a wonderful job of keeping the meat moist after all the grilling. A sweet and slightly tangy marinade created a little bit of a crusty caramelized outer layer that gave way to tender well seasoned meat. 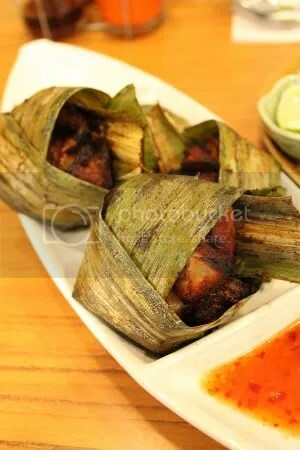 The pandan leaf prevented most (except some of the ends) of the chicken from getting charred over the fire and imparted some of it’s fragrance into the meat. So many flavours created out of normal chicken- delish! Oh and ladies, note that you don’t have to remove the leaf. There are no messy scenarios involved here! 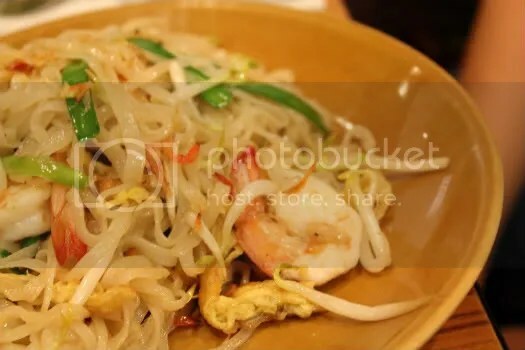 The phad thai raved about so much in the blogosphere seemed to be pretty good, seeing how the friend wiped the plate clean. 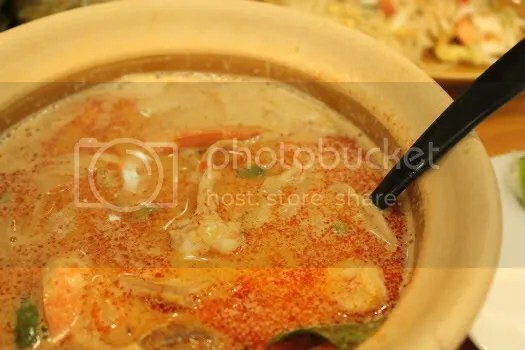 My tom yum seafood with noodles (top up $0.70) was really generous with the ingredients and I loved all the different mushrooms they gave me! The slippery thai noodles were such a joy to slurp up with the spicy tom yum soup. Comfort food at its best. Before the reno, I visited them just in time to have a taste of their chesnut brandy and white chocolate with cranberries that I totally went head over heels over. Above is the combination of chesnut brandy and granny’s favourite. Granny’s favourite tastes like horlicks with chocolate: pretty good but I won’t say it’s my favourite. Chinese new year flavours were out for today’s opening. Spotted Luo Han Guo and Pineapple Tart ice cream but I was too full to take samples. Today’s order for me was black sesame and pumpkin with candied winter melon. Black sesame failed to impress because of it’s slightly diluted flavour. 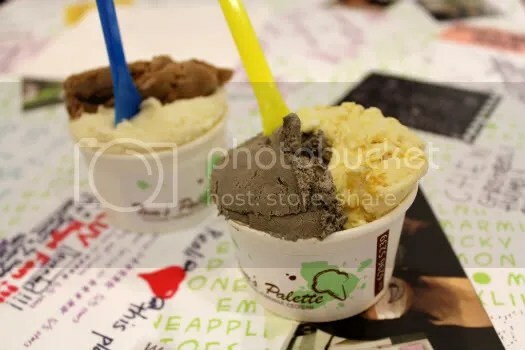 I still prefer Haato’s black sesame or Daily Scoop’s, especially the latter which is terribly rich and sticky with swirls of black sesame paste! On the other hand, pumpkin and candied winter melon was a hit. 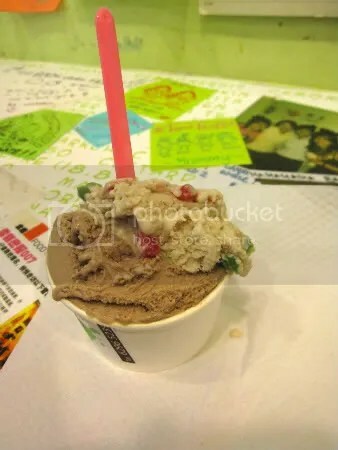 Sweet chunks of candied winter melon that brought back all the memories of chinese new year and mellowed overtones of natural sweetness from the pumpkin painstakingly blended into the ice cream. Do try the other CNY flavours and tell me which are worth the trip down!